Lucy, daughter of the Henry Somerset, 2nd Earl of Worcester SEE ATTACHED 3 and second wife Elizabeth daughter of Sir Anthony Browne and Lucy daughter of John Neville 1st Marquess of Montagu. Lucy seems to have been a woman as distinguished by her virtues as her husband Sir John Neville, 4th Baron Latimer was by their absence. 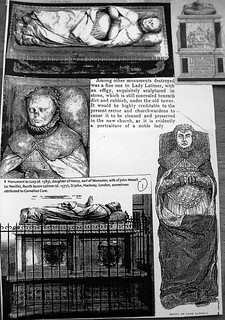 They had 4 daughters who all married into leading families with the result that the Latimers who were a cadet branch of the great Neville clan became merged into the most powerful strains of English nobility. 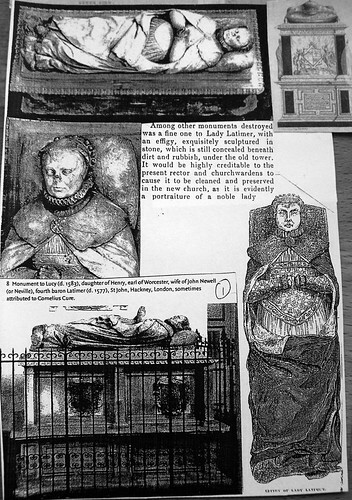 She died in London at her eldest daughters house and is commemorated by a splendid tomb with her effigy in Hackney Parish church"
Her husband Sir John Neville, 4th Lord Latimer www.flickr.com/photos/52219527@N00/2313867321/ The guidebook says "what is known of his life is not much to his credit, there was a squalid feud with Thorp Perrow which led to violence and assaults by the servants of both parties. He also fell into debt and was in the Fleet prison on at least 2 occasions.